1941-1984 Big Twin. 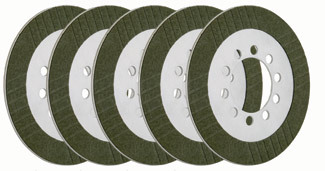 Includes five aramid fibers friction plates (6061 T6 aluminum core) with maximum depth groove pattern for efficient heat dissipation and oil circulation. Included are four tempered steel drive plates. Clutch pack height is preset for easy installation. Frictions and steels 1.575 to 1.590"